WELCOME TO THE WEBSITE OF GASTLAND M0! As the head chef of Gastland Bistros and as a family man, I know how it is when the family gets hungry during a long journey. I was wondering a lot about which dishes truly measure up to the expectations of our guests with various tastes. 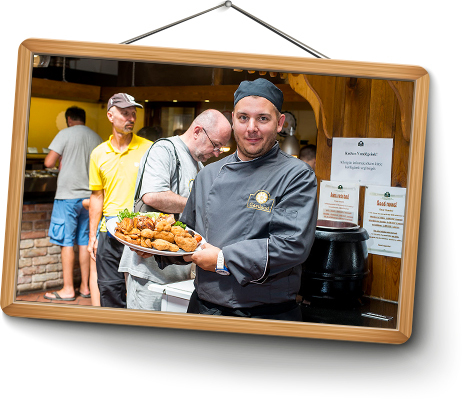 I have shaped the offer of Gastland Bistros in a way that, in addition to the traditional Hungarian cuisine, the most popular international dishes can also be found in our all you can eat selection. Among our dishes made from fresh ingredients our guests can choose from 3 types of soups, many one-course dishes, vegetable dishes, grilled vegetables and meat, fried vegetables and meat, pizzas, salads and desserts. In our spacious, bright restaurant you can also choose from our A 'la Carte menu besides the dishes in our all you can eat selection. * The given prices allow 2 hour long unlimited food consumption. The promotional prices are valid in case of at least one drink order per person. The given prices do not include the prices of the drinks.